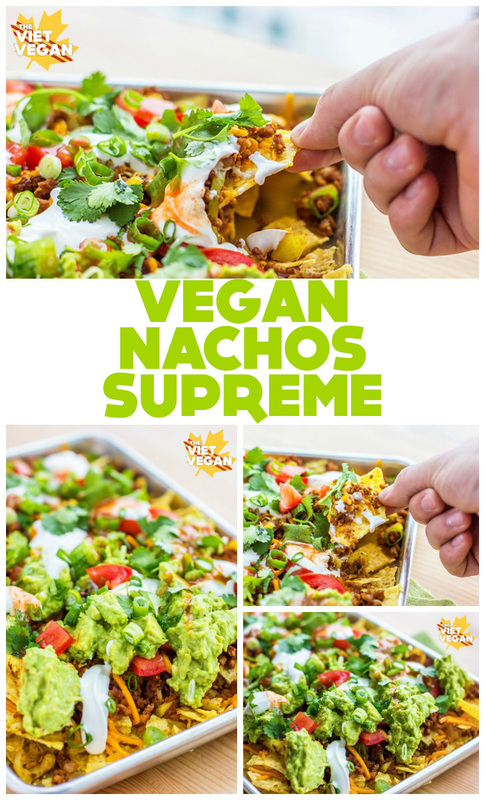 Don’t skimp on your nachos, go all out with these vegan nachos supreme. over a bed of vegan cheese and seasoned soy crumble. Lately I’ve been at the whim of my cravings. 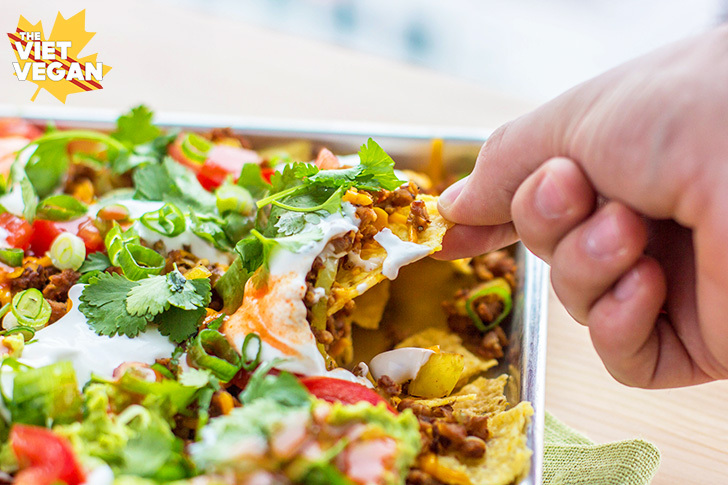 The craving for fresh air, the yearning for a new phone case to add some colour to the daily mundane, and predictably the urge to dig in to a sheet-full of crisp, nachos with all my favourite fixins’. 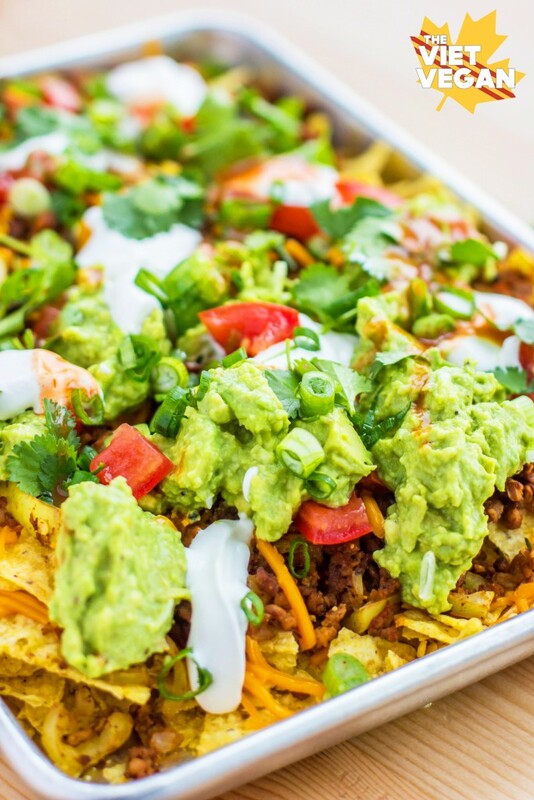 Somehow, both Eddie and I have seemed to sync up our cravings, or perhaps its just Eddie succumbing to my desire to get late night bubble tea or impromptu chili cheese fries from the Hogtown Vegan. As you may have noticed, Eddie and I have been officially living together for a couple of weeks now. Our apartment is still slowly taking shape (we had a lot of rearranging to do), and there are still a couple things here and there we need to find permanent homes for, but the transition towards a combined household has been surprisingly smooth. We compensate for each other’s laziness: I’ll cook when he unmotivated to make something, and he’ll take out the garbage and recycling when I start to let the bins overflow. He gets the laundry started and I’ll drag him to the pile of clean laundry so we can fold it together. Having him around means that I always have someone to go get ice cream with or to lift up my spirits after a long day. I don’t know how I ever did long distance before. Sometimes I worry that I’ve become dependent on him, but I think that we’ve both become dependent on each other—in a healthy way. We both need and want to wind down and talk about our day together, and that’s something I’ve never experienced before. It’s so interesting to find that person that is exactly your brand of weird. I make weird noises and take jokes a little too far, and he’s feeding my frenzy by retaliating with his own ridiculousness and jokes. We are equally prone to staying up too late or sleeping in too long, and we both find crowds exhausting. It seriously blows my mind that he is real. He knows exactly what I need to hear, he does precisely what I need him to do when I feel stressed out, and we both find pleasure in doing ridiculous things just to crack each other up. I don’t understand how we managed to find each other but I am profoundly grateful. Thank you Universe, for leading me to the person who knows me better than I know myself. I was an utter wreck at the moment we met and somehow I found the person who had the patience to help me put the pieces of myself back together. The other day I had the realization that April was just around the corner, and I was reminded that this time last year I was actually a basket case. At this point last year, I would have emotional breakdowns every couple weeks. I literally shat myself on the subway in front of a few dozen people and shut down a few days later when someone stole my phone. I locked myself in my room for two days and just watched Daredevil with the curtains closed because I didn’t want to deal with life. Fast forward a year, and I am the happiest I have ever been. I am in disbelief. I wanted to thank all of you for reading and sticking with me through my emotional rollercoaster over the past couple of years. I was barely posting here because I lost any spark of creativity. I should have known that the lack of creative spark was a sign that something wasn’t right, but you waited it out for me to get my poop in a group. And here we are: regular weekly posts, a new fancy newsletter format (FYI it’s going to be a summary newsletter that gets sent out twice a month with some extra fun tidbits just for my subscribers), weekly YouTube videos, and (mostly) daily Instagram posts! Thanks for being there and reading my thoughts. It’s nice to be heard. Prepare your crumble by heating grapeseed oil and cooking onion until translucent. Add banana pepper and cook until slightly softened. Add vegan crumble and spices and stir to coat. Add dark mushroom soy sauce and water as needed to add moisture into the crumbles (depending on the type of soy crumbles you use, the moisture content may vary). You may find yourself using just a tbsp or two, I used about 1/4 cup. Once cooked, taste and add salt and pepper to your liking. Turn off the heat and set aside. 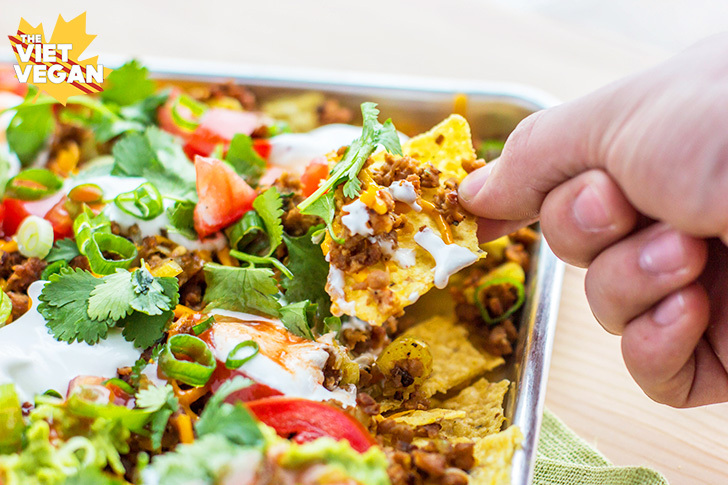 Layer tortilla chips and add about 1 cup of cheddar shreds on top of the tortilla chips. Add a layer of the cooked crumbles then the second cup of cheddar shreds. Bake for about 10-15 minutes until the cheese has melted through. 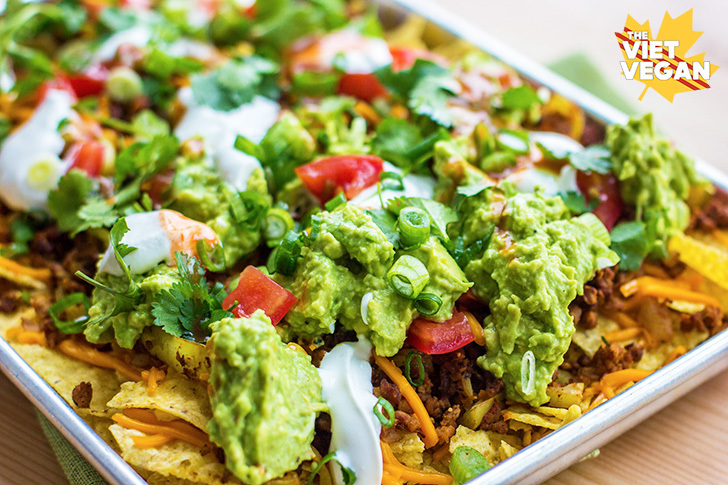 Add a layer of the diced tomato, then add dollops of guacamole and vegan sour cream. Garnish with plenty of green onion and cilantro and hot sauce as desired. *I typically use 1 avocado, 1 clove of garlic, 1 tbsp lime juice (about half a lime), some salt and pepper, and mash it all together.